When asked if an accelerant was used, department spokeswoman Melissa Taylor said they’re not providing any other details about the case, at this point. Denver Police Department's mobile crime lab pulled up to the burned-out building just after 6 p.m. Tuesday. At least 20 families were displaced by the blaze late Easter Sunday. 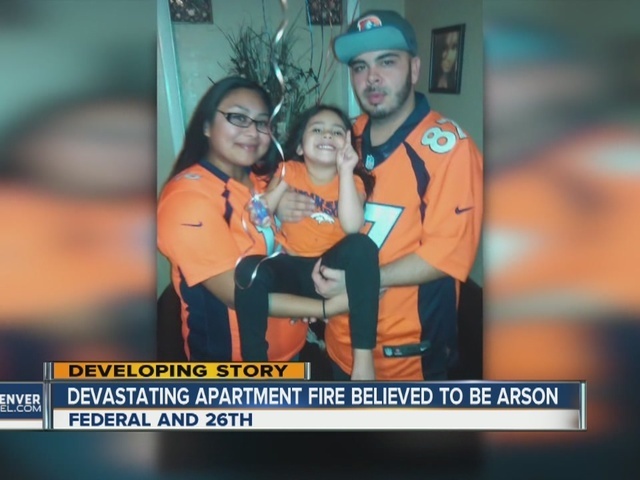 Chris Pena, Aylessa Miera and their baby daughter, Ava, were on the third floor in their apartment when fire broke out in the hallway. “I heard the smoke alarms,” Pena said. “I thought someone was burning something (on their stove) so I didn’t get up. A minute later he saw smoke coming under his door, so he opened it. His girlfriend, Aylessa, was holding their baby. "As soon as the apartment filled up with smoke, I remember thinking like this is it? This how we're going to die, you know from a fire?” she said. Pena said that’s when he saw a woman over at the nearby 7-Eleven. He said the woman (later identified as Reyna Rodriguez) and the man (later identified as Lee Velez) ran over and held a blanket between them in order to catch the baby. "I had to let my baby go. That was the hardest thing," Miera told Denver7. Velez said that as the baby came down, he dropped his end of the blanket and caught the baby with his bare hands. 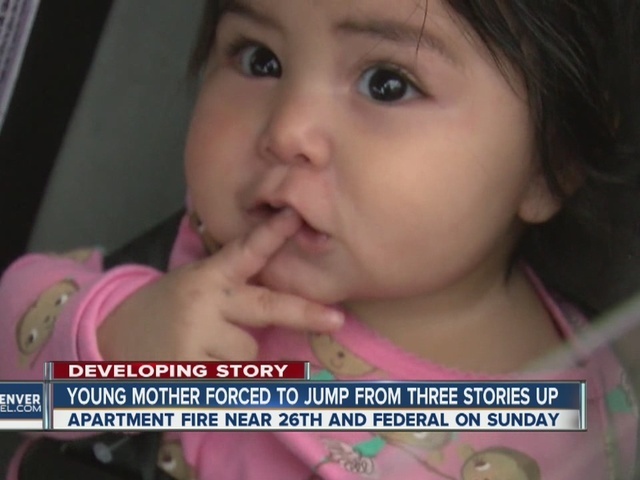 Pena said that after their baby was safe, they jumped. He says he landed okay, but Miera ended up with a fractured vertebra. She was released from the hospital Tuesday afternoon. "I thank God. I thank God so much. And you know what I don't even care I lost everything in the apartment. I'm alive,” she said. A fund has been set up to help the young family. Gonzales said she was shocked to hear about the investigative turn. Some residents reported hearing arguing just before the fire broke out. Four dozen firefighters responded to the two-alarm fire. Crews positioned ladders against the upper level windows and rescued multiple infants, children and adults. The American Red Cross Mile High Chapter is assisting the fire victims. The president of Brothers Redevelopment said it’s sad that someone might have set the fire intentionally. He said his organization is doing what it can to assess damage and figure out what it will take to make repairs. The building has been locked up and taped off. A sign on the alley side entrance warns of asbestos inside.